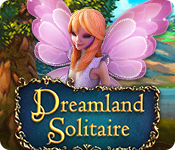 Dreamland Solitaire is rated 4.9 out of 5 by 17. 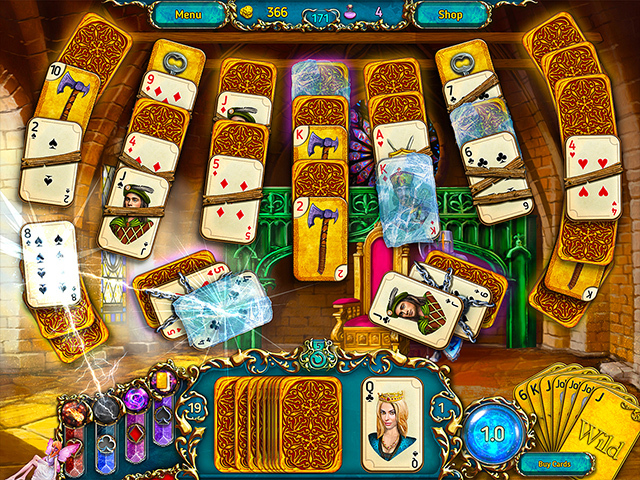 Rated 5 out of 5 by denniann2 from a really good solitaire game one of the few solitaire games i have ever finished. sometimes it takes strategy to finish. i think i had to replay 4 or 5 levels to finish the game. that is ok. you earn coins to buy extras to help you finish the game. i love it! it has 200 levels. Rated 5 out of 5 by bebow51 from Fun Solitare Game This is the best solitare game ever! PLEASE bring on more ! Everything about this game is pleasing. One thing though, it could have been longer! :) That little staircase going down . . . could have been another level! No matter, this is a wonderful game and I hope more are in the works to come soon. Rated 5 out of 5 by TheRealMagicJack from I'm Making Myself Stop This game has me hooked. It's big, fun, and challenging with a nice assortment of power ups.. Highly recommended. Rated 5 out of 5 by zayazz from WOW This game has captured my mind, time passes by unnoticed while playing it! Cool graphic and very pleasant music. Thanks author for this masterpiece!!! 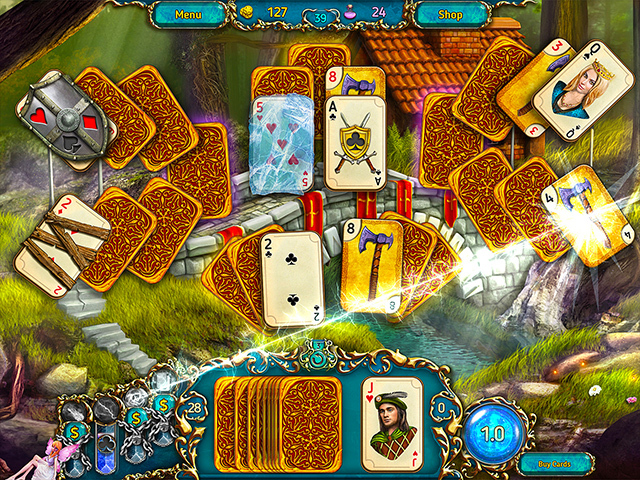 Rated 5 out of 5 by muhukohuk from Cute solitaire game What I loved: Fantasy theme Choice between casual/timed mode Custom obstacle cards that require interaction Choice of boosters to unlock in the shop What can be improved: An opportunity to jump straight to the next level would be great. Rated 5 out of 5 by cowclaudia from Kudos! I'm thoroughly enjoying this game (to the point of neglecting my other ones) which I haven't in a solitaire game for a long time. This is the high/low solitaire where you accumulate manna bottles to use to build different areas of the scenes and gold coins to buy power-ups. One thing I really like about this game is that once you buy a power-up it's yours you don't have to keep re--purchasing it and you can also upgrade them, plus a great benefit of a "power-ups load faster" selection pricey but worth it. The scenes are well done - not overly artistic but not hard on the eyes, music is pleasant and not intrusive to the game play and you have three levels of play. You can't go wrong with this one if you're a solitaire lover! Rated 5 out of 5 by pearl_si from Finally!!! Well what do you know? A developer finally listened to the reviewers and came up with a game that gives a player everything you could want. This is really great solitaire game. I bought it after only 4-5 hands. You will not be disappointed, definitely worth a purchase. Rated 5 out of 5 by mygames49 from nice and smooth it is what it is. wonderful game!!! buy it today. you will not be disappointed. plenty of powerups plus you get to build a town. 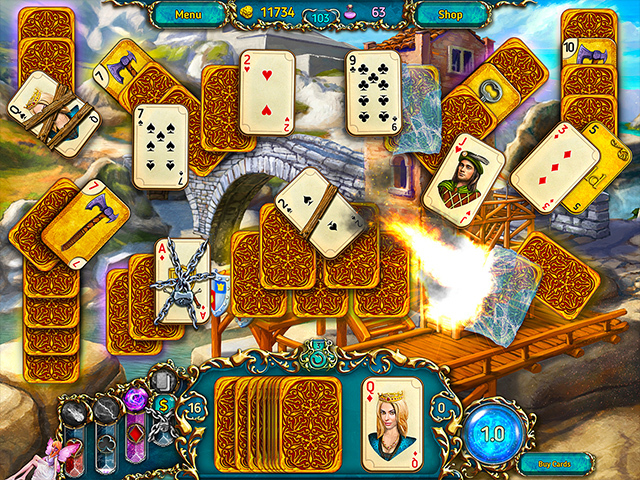 Rated 5 out of 5 by JeansLady1 from Instant Buy for Me I downloaded it, played 3 levels and purchased it. I am basically echoing the very detailed 5-star reviews. This is a terrific solitaire game all the way around. No "downers." I especially like the types of bonuses, variety of things you can purchase throughout the game, and the number of levels/locations to play is insanely high which gives you a great "bang for your buck." Visually, it's a feast for the eyes. I am also a great fan of games that allow me to build something, which this one also features. This game will keep me happily satisfied for quite some time. I like to alternate playing TM games with solitaire games. Each one gives me a fun break from the other for a little while.